The F-350 is Ford's Super Duty full-sized single rear-wheel (SRW) or dual rear-wheel (DRW) truck. The F-350 manages to mix innovation, comfort, and style into a competitive vehicle that has impressive torque ratings, towing capacities, and payloads. The 2013 F-350 is available as a 4x2 or a 4x4, has three different cab configurations, and has three trims available. The rugged and reliable XL, the well equipped XLT, and the luxurious Lariat. Two engine choices include a standard 6.2-liter 385-hp Triton V8 with 405 lb.-ft. of torque or the optional and innovative 6.7-liter turbo 400-hp V8 Powerstroke diesel with 800 lb.-ft. of torque. Both engines are mated to a new TorqShift six-speed automatic transmission with SelectShift and a Tow/Haul mode. The F-350 offers standard amenities such as traction control and electronic stability control (SRW only), a hill launch assist feature, side curtain airbags, a tilt and telescoping steering wheel and trailer sway control. Available features include a supplemental cab heater, a reverse camera system, upfitter switches, a navigation system, a remote start system, satellite radio and a rear folding tailgate step. Also, the unique Ford Work Solution options provide innovative solutions for trucks used in the work place. 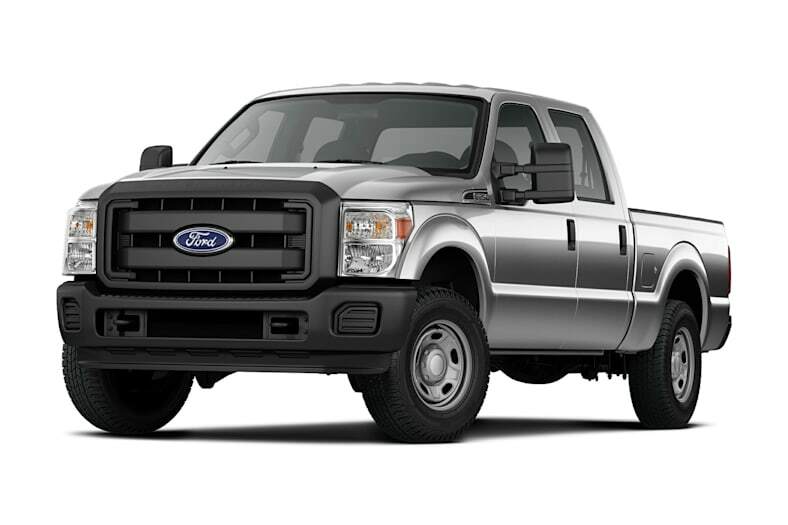 For 2013, the Ford F-350 adds new exterior paint colors for all trims and the new extravagant Platinum package is available on the SRW 4x4 crew cab models and both DRW crew cab models. The XLT trim has new standard equipment which includes SYNC, a compass and the power windows now have a one-touch up and one-touch down feature for the front driver and front passenger. The Lariat trim has new standard equipment which includes a 200 amp alternator, SYNC with MyFord Touch, a Sony audio system, a rear parking camera and a one-touch up and one-touch down feature for the front driver and front passenger.